M3D Printer Review – How Affordable is the Micro 3D Really? The Micro 3D Printer started like many of the products in the 3D printing world, as a Kickstarter.com campaign. However, while Kickstarter campaigns accomplish widely varying results, the Micro 3D Printer was incredibly popular. The campaign raised over three million dollars and had almost 12,000 contributors. Michael Armani is the founder of M3D and has a background in materials engineering, along with David Jones who was a former software programmer with experience in robotics engineering. Part of their goal in developing the Micro 3D Printer was to offer a unit that is accessible to all consumers from a price standpoint and easy to learn. The Micro 3D Printer is priced at $349 (check here for stater pack) and offers print quality that is well above average and actually surprisingly good for a very small and portable unit, although it is limited somewhat in the size of products it can effectively produce due to its size. Final Verdict – Enough Value? Setup: The printer arrives efficiently boxed and the initial setup process only takes 10-20 minutes depending on how experienced you are. 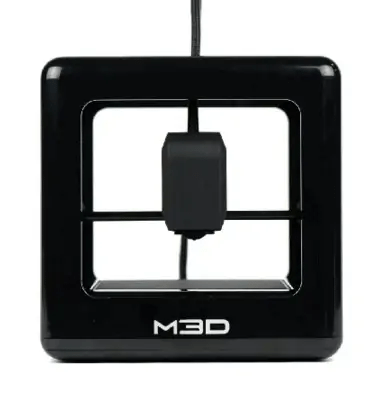 However, even for those that have never dealt with 3D printers before it is relatively easy and M3D intentionally made sure to keep things straightforward and simple. Easy ownership was a cornerstone of the design process and M3D made it a priority. Connecting: Once you remove the unit from the box, the setup process involves simply connecting the power cord and a USB cable to your laptop or desktop. After that, it’s just a matter of downloading the appropriate software for your operating system from M3D’s website. The software is compatible with Mac or Windows and they just released a new version that is compatible with an expanded list of Mac and Windows OS versions. Software Learning Curve: The management software much like most aspects of the rest of the printer is simple. This is both good and bad, as it is easy to learn and navigate but offers relatively few options when it comes to customizing certain aspects of the 3D printing process. However, recalibrating the printer head or adjusting the X, Y or Z axis of a product model is easily accomplished, even for beginners. Color Options: The Micro 3D is offered in 6 colors that include white, black, orange, green, blue and a very cool transparent color. There is an additional charge for the white or transparent color of twenty-five dollars but at a starting price point of $349 that shouldn’t present much of a problem for most people. Print Speed: One of the downsides of the small size of the printer is it is relatively slow. A product that is 1.5 inches in height and 4 inches in diameter can take approximately four hours to completely print, depending on how much detail is involved. A very detailed product with the same dimensions might take as much as six hours to finish printing. Build Size: The size and price versus the slow printing speed are something to keep in mind if you are thinking about purchasing this 3D printer model. However, for most that are trying 3D printing for the first time or interested in a small sized 3D printer for specific reasons, the printing speed is usually not a big concern. Obviously, there are other models available that offer significantly faster printing speeds but you will probably have to spend two to four times the cost of the Micro 3D Printer for faster printing speeds. Accuracy and Noise: Two characteristics of this small 3D printer that standout are accuracy and the fact that it is surprisingly quiet. In fact, it is one of the quietest 3D printers on the market regardless of size or price range. While many 3D printers make a distinctive and fairly loud noise while printing, the Micro 3D’s print head only makes a quiet whispering noise as it navigates around the printer’s bed. Print Bed: The printing bed offers an intuitive design with the spool of filament fixed underneath the printing bed area, which is convenient. The print bed is removable as well. The build volume of the printer is 4 and 1/3 inches by 4 and 1/5 inches, with an upper build limit of only 4 inches in height. It’s no secret that a 3D printer of this size is going to offer a smaller build area. However, it is something to keep in mind depending on the size of the products you intend to work with. Software: The management software does allow you to scale .stl files either larger or smaller, so it is possible to take a six-inch product and reduce it to only three or four inches while retaining accuracy. High Level of Detail: While the printer is small and, therefore, limited in the size of objects it can print. The printer is capable of printing multiple smaller objects that will fit together to create a larger product. You are only limited by your imagination in this aspect but even very detailed items like gears and gear arms can be printed with suitable quality for a workable product when the parts are put together, which is quite amazing for a 3D printer of this size and price range. Resolution: In addition to above average overall printing quality, this M3D printer offers excellent resolution as well. The surfaces do have a small amount of ribbing but they are smooth enough and you can adjust the thickness of layers from fifty to three hundred fifty microns. Even the best products have a few drawbacks or challenges and the Micro 3D Printer is no different. Not Great of Large Projects: One of the issues with the product is found in its management software, specifically, with the time it estimates printing jobs will take. The software does a good job at estimating small projects accurately but when you deal with larger printing projects that take an extended amount of time it is not accurate at all. This is not a big problem as after you work with the printer on a few jobs you will get a feel for the amount of time a project will take. However, it is a feature that will hopefully be adjusted or fixed in the future as it would be nice to have accurate times presented. No Onboard Memory: Another problem is the unit does not have any onboard memory. This means that once you disconnect the USB from your laptop or desktop, any pending or in-process print job is lost. You cannot simply reconnect the cable and expect the printing job to resume where it left off, all the memory is lost and you must start over. Again, this is not a huge problem as this probably would not occur very often but it is something consumers should know before making a purchase. Flashforge Dreamer: The Dream is Flashforge’s more advanced and refined 3D printers. It’s designed less for DIY tinkerers and more for professional grade operations where repeat quality and precision is paramount. Read the full review I did here. Makerbot Replicator: The Replicator 2 is among one of the more popular 3D printers out there, largely because they were the “first to market” with truly professional grade 3D printers. While they do run a bit pricey, they are at the forefront of 3D printing in terms of features and design. The full review is here. Lulzbot Mini: This is one of my favorite 3D printers out there. It’s not a closed-architecture system, but it is the perfect blend of DIY customization and reliable repeat performance. My full review can be found here. XYZPrinting Da Vinci Jr: For a truly compact entry-level 3D printer, you can’t beat the Da Vinci Jr. As it sounds, it’s ideal for younger audiences, but also great for enthusiasts looking for something basic and reliable. Check it out here. As a portable and high-quality 3D printer, the M3D Micro 3D Printer is an excellent overall value. If you can deal with the relatively slow printing speed and the other small challenges mentioned above, then there are many things to like about this unit. Additionally, at a price point of only $449 for the starter package, it offers exceptional functionality for a very low cost compared to many other units available in the 3D printing space. If you are looking to experience 3D printing for the first time or you need a relatively inexpensive unit that is portable, then the Micro 3D Printer is a great option.